If you can beat this man in video game tennis, you can win a trip to Spain. That was fast: Derrick Rose, already a starter in the NBA All-Star game? If Sam Smith says it’s true, then it must be so. GQ says this blue button down is the shirt of the season. We’re guessing it costs between $200 and $400, and like most shirts of the season, is not resistant to coffee stains. Win a trip to Spain: So it offically snowed last night. Which means you officially want to get the hell out of Chicago soon, at least for a week. If you want to go to Spain, and play Rafael Nadal in a game of tennis (honestly, you don’t want to do the latter — because it’d be embarrassing — but you definitely want to go to Spain, even if your attempts to dance with Spanish women will also be embarrassing) check out the Ace Rafa game by Bacardi. Basically, you have to beat Nadal in a game of computerized tennis. The game play reminds us of Scottie Pippen’s Slam City. Except we paid $50 for that in the mid 90s. This game is free. 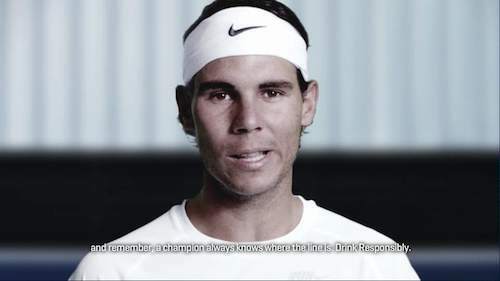 And if you beat Rafa, you’re eligible to win a trip to Spain. Slate tells us how a “private-equity firm would refurbish the United States for quick resale to China.” We assume this would result in the USA becoming a massive Foxconn facility.